I’ve always wanted to cook a turkey and have that American Christmas. It’s something you always see on TV with the centrepiece being this just golden brown turkey straight out from the oven looking ever so lovely. 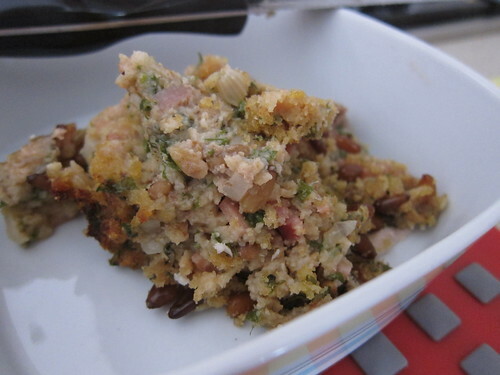 This recipe I’ve tried a couple of times and the stuffing that goes with it is absolutely delicious. It can really take quite sometime to prepare and wait for it to cook but the end result is always satisfying. Check out the recipe below, I believe it’s from Women’s Weekly Christmas Edition from a couple years back. 2. Preheat oven to 180C (160C fan-forced). Discard neck from turkey if still intact. Briefly rinse turkey under cold waterl pat dry inside and out with absorbent paper. Fill neck cavity loosely with some of the stuffing (don’t pack too tightly, as it will stop the meat from cooking evenly). Secure skin over the opening with toothpicks to enclose stuffing. Fill large cavity loosely with remaining stuffing (you may have some stuffing leftover). Tie legs together with kitchen strings tuck wings under. 3. Place turkey on oiled rack in a large flameproof baking fish. 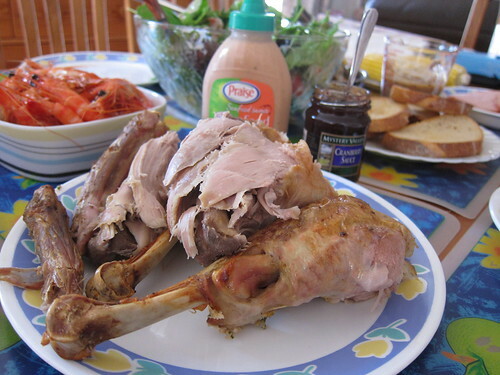 Brush turkey all over with half of the butter, rub a little salt onto skin. Pour the stock into the dish. Cover dish tightly with greased foil; roast for 2 hours. Uncover turkey; brush with remaining butter. Roast, uncovered, for a further 1 hour 30 minutes or until browned all over and cooked through, adding more water to the dish if needed. Remove turkey from dish, cover turkey with foil; stand for 15 minutes while preparing gravy. Test it by inserting a skewer sideways into the thickest part of the thigh, then remove and press flesh to release the juices. If the juices runs clear, then the turkey is cooked. Make it as per the recipe but increasing the eggs to 2 eggs. Shape into a 28cm log on an oven tray lined with baking paper. 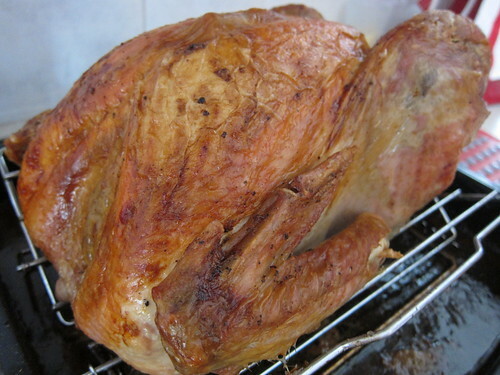 Once the turkey is cooked, increase the oven temperature to 200C (180C fan-forced). Cook, uncovered for about 20 minutes or until well browned and crisp. 3. Separate drumsticks from the thigh by cutting through the knuckle at the point of the bend. 4. Make a vertical cut above the wing through the body and remove. Repeat these steps for the other side of the turkey. Following the recipe to a T, it works out wonderfully. The meat of the turkey comes out so buttery smooth and just cooked to perfection. It can be very easy to overcook turkey. I find it you stick with those meat thermometer recommended temperatures like at 90C it can be a tad dry. I find that you can have great tasting turkey at around 77C but should be at least 74C for health and safety reasons. 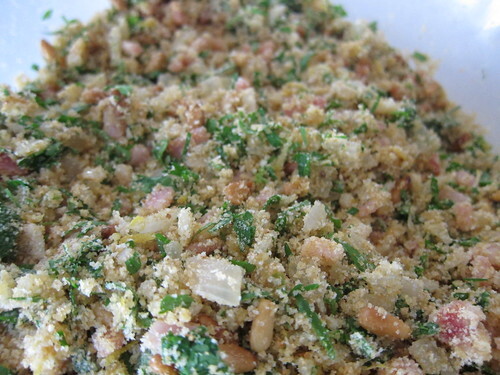 The stuffing is the best stuffing I’ve ever had, and the parsley and pine nuts play a big part in that. It truly is a wonderful recipe. I’ve never tried the gravy to be honest, as I like to eat turkey with just a bit of tabasco sauce but I think most gravies taste similar so never bothered with it. The recipe is also very easy to follow and the hardest part is basically making sure the turkey is cooked right so once you got that down, cooking turkey will become a breeze. I discovered Tanner’s Swiss Patisserie whilst heading for lunch on Blackburn Road. Apparently Tanner’s has been there for decades, and it has this lovely wooden cabin exterior which is so visibly different from the shops around it that you’ll be instantly drawn to it. It’s a small shop but never quiet. The Patisserie sells cakes, tarts, pastries and bread and of course coffee. Their mini pastries, cakes, and tarts looked delightful so we had to try a few. The pastry pictured above is filled with Hazelnut cream. I’m not quite sure of the advertised name but we bought this because she mentioned hazelnut. 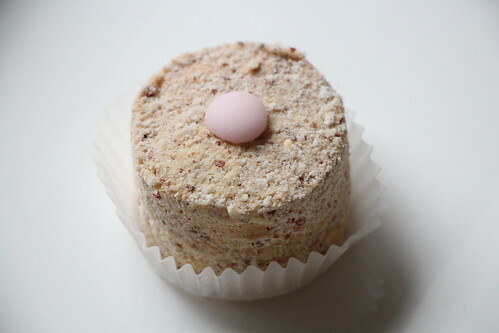 Its like a light cookie crumb with a layer of hazelnut cream inside. I found it very sweet overall, and a bit lacking in hazelnut flavour to be honest. It looked fantastic though. Tanner’s Pecan Pie is as it looks, rich but definitely oozing in flavour.The pecans are still crunchy, with a dark and rich sweet hardened filling. Even though it’s sweet, I found it to be more well rounded in its flavour. The pastry is nice, short and crispy. With a lovely butter texture to it. A real treat. Their Linzertorte, which is basically a jam filled cinnamon and clove flavoured butter pastry. The tart is perfect, again short, crispy with that rich buttery taste. The ground cinnamon and cloves give the pastry an extra kick and usually with Linzertorte, the pastry is also made with ground almonds that give it a softer texture than most shortcrust pastries. 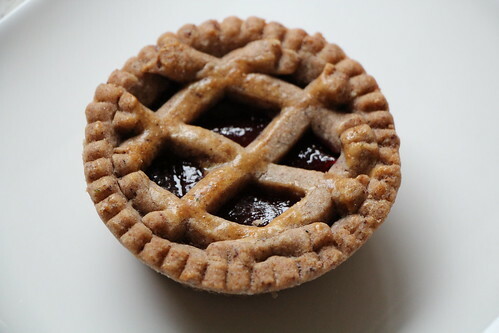 I find that the jams or berry preserves used in Linzertortes to be overly sweet and the ratio between pastry and jam leans too far in the favour of the jam. A very thin layer is all that’s needed in my humble opinion, or a reduction in sweetness in the jam but I think that’s the more difficult option to produce since a lot of sugar is required to give it that texture and consistently. 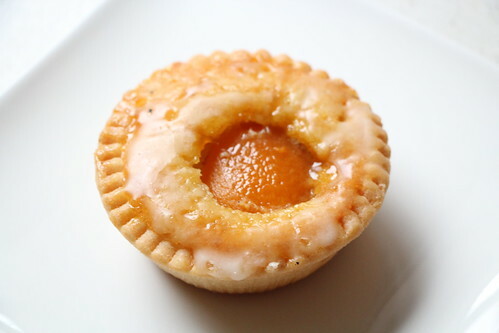 Tanner’s Apricot Almond Tart is also very tasty. The pastry again is top notch, buttery and crisp. The tart is glazed with sugar to give it that glistening shine. 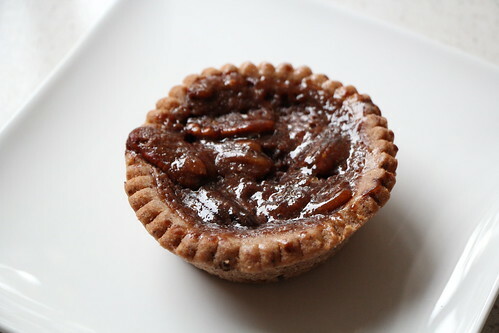 Using ground almonds gives the tart a moist texture to it and definitely one of the better tarts I’ve tasted. Tanner’s Swiss Patisserie has wonderful pastries and tarts but like most patisseries their sweet delights are a tad too sweet for my liking. A small bite is all I need to be satisfied and these little tarts will do that just fine. This probably isn’t the best time to post this seeing as it’s July. I always end up making things too late or even after the particular festive time comes around so this is just typical me. I love the smell of warm hot cross buns, it’s that cinnamon and spice mix that just keeps me calm. I also love kneading bread so making hot cross buns is jut plain relaxing. I found a recipe on Taste.com.au and it’s quite a good recipe irrespective of my little mistakes whilst trying to make it. Check it out below! 2. Melt butter in a small saucepan over medium heat. Add milk. Heat for 1 minute, or until lukewarm. 3. Add warm milk mixture and eggs to currant mixture. 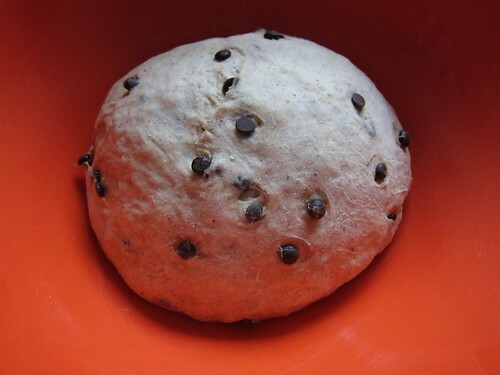 Use a flat-bladed knife to mix until dough almost comes together. 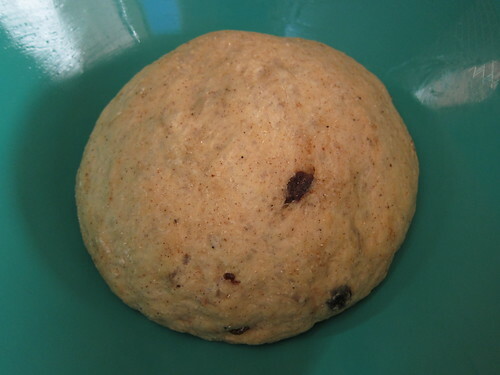 Use clean hands to finish mixing to form a soft dough. 4. 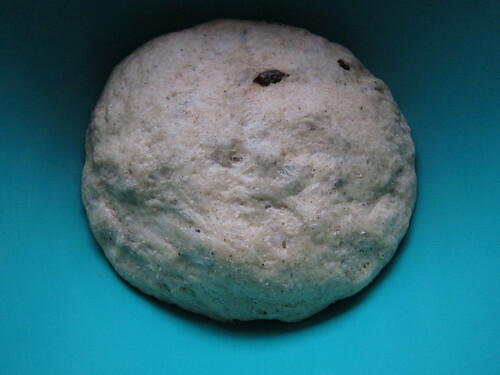 Turn dough out onto a floured surface. Knead for 10 minutes, or until dough is smooth. Place into a lightly oiled bowl. Cover with plastic wrap. 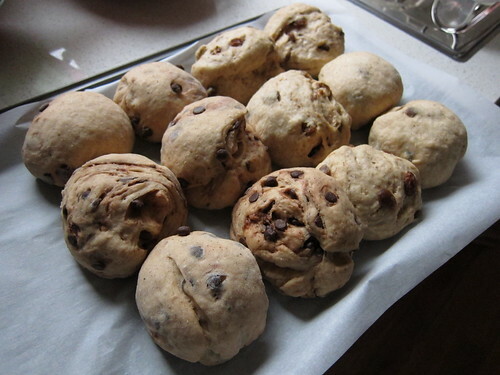 Set aside in a warm, draught-free place for 1 to 1 1/2 hours, or until dough doubles in size. 5. Line a large baking tray with non-stick baking paper. 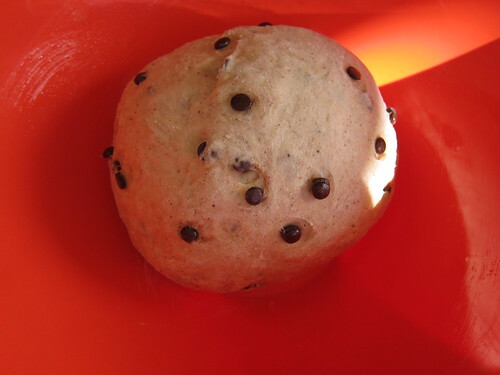 Punch dough down to its original size. Knead on a lightly floured surface until smooth. Divide into 12 even portions. Shape each portion into a ball. Place balls onto lined tray, about 1cm apart. Cover with plastic wrap. Set aside in a warm, draught-free place for 30 minutes, or until buns double in size. Preheat oven to 150/160°C. 6. Make flour paste: Mix flour and water together in a small bowl until smooth, adding a little more water if paste is too thick. Spoon into a small snap-lock bag. Snip off 1 corner of bag. 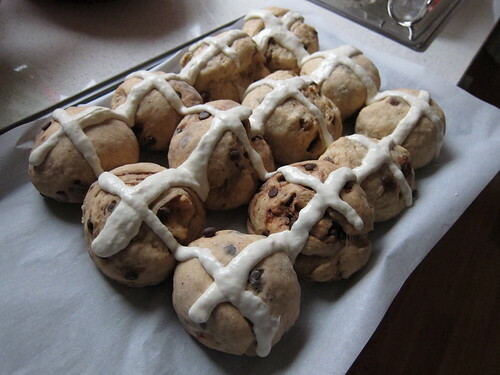 Pipe flour paste over tops of buns to form crosses. 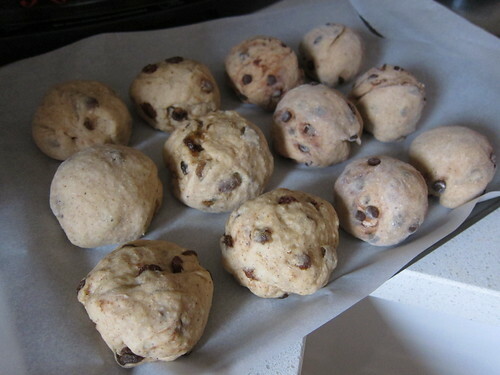 Bake for 20 to 25 minutes, or until buns are cooked through. 7. Make glaze: Place water and sugar into a small saucepan over low heat. Stir until sugar dissolves. Bring to the boil. Boil for 5 minutes. 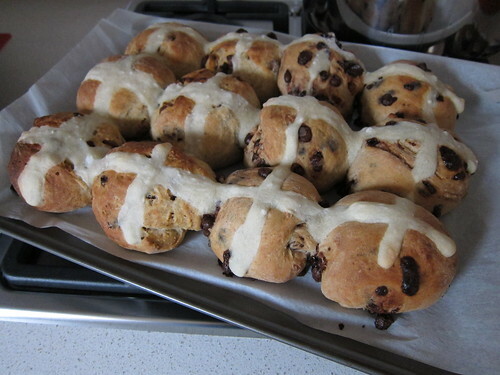 Brush warm glaze over warm hot cross buns. Serve warm or at room temperature. The original recipe asked to preheat at 190. I disagree as it turns out, it’s way too hot for my particular oven. It should be more at 150/160 especially if it’s fan forced. Otherwise the bun browns too fast and the inside is undercooked. My other mistake was I poured the warm mixture of butter and milk onto my dry ingredients for my choc buns I let it sit there whilst I kneaded my currant dough. Big mistake, as it became all stiff and hard once I got back to it. So if you want to split the mixes, either knead/mix the wet and dry ingredients really quickly or do it one at a time. I was just worried the warm milk and butter mixture would cool too quickly (it didn’t). 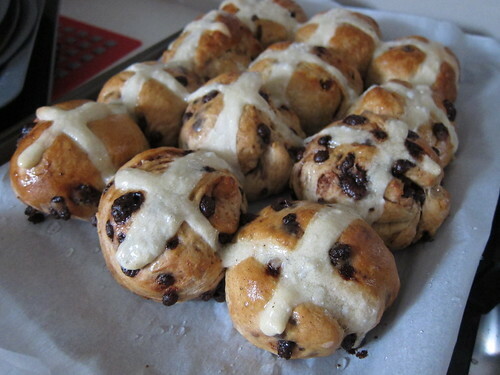 My currant hot cross buns were soft and had a beautiful fragrance to it. These are best eaten fresh as they get hard pretty quickly unless you warm them up in the microwave. 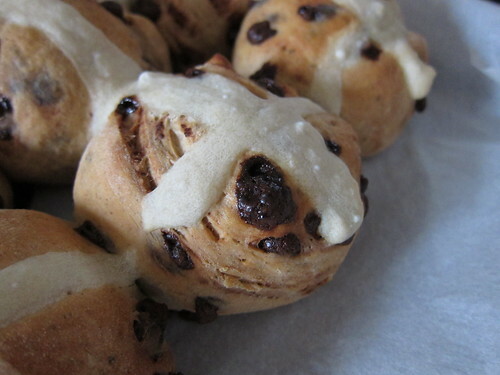 So it’s a good recipe but I’ll probably try another recipe when Easter comes around again. One day I had the urge to make Cranberry and White Chocolate cookies, I think I’ve seen it in stores before but I had this idea that dried cranberries were small and diced. I was searching high and low for these cranberries but to no avail. I don’t even think they exist now. So instead I bought the usual dried cranberries which are a bit chunky. I came across this recipe from Rachel @ Simple Girl and they looked absolutely delicious. 1. Heat oven to 175 degrees Celsius. 2. Beat together margarine and sugars until creamy. 4. Add combined flour, baking soda and salt. Mix well. 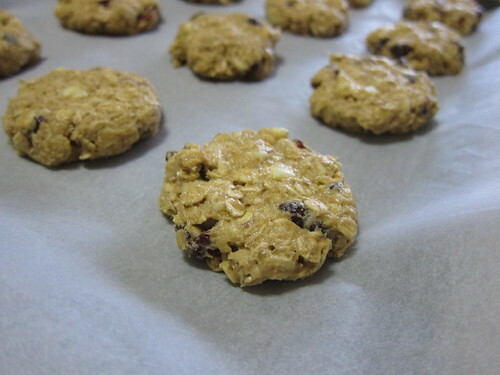 5.. Stir in oats, dried cranberries and white chocolate chips. 6. 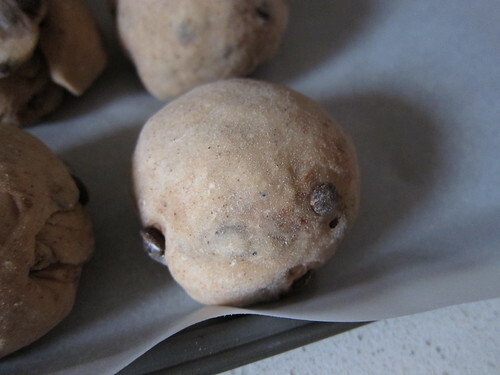 Drop by rounded tablespoonfuls onto a parchment lined cookie sheet. I liked this recipe but even after reducing the brown sugar and caster sugar it was still very sweet! I think it was because both the cranberries and white chocolate are already sweet. If I were to make these again, I would reduce the white chocolate to 1/2 cup as I put in 1 cup when I made these and the white chocolate was too plentiful. The oats can be slightly big so you may want to add them to a food processor give it a couple seconds whizz so the oats are a tad smaller. 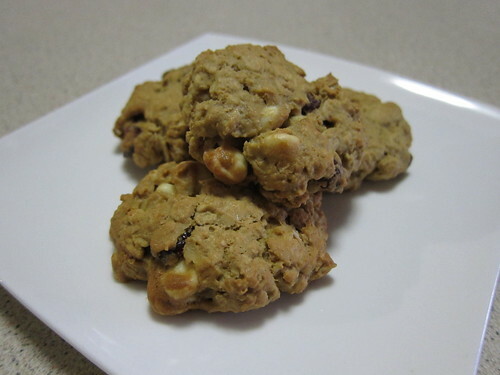 These cookies with oats aren’t your typical crispy/crunchy type, because of the oats it makes it slightly soft so if you’re not fond of it then this might not be for you. 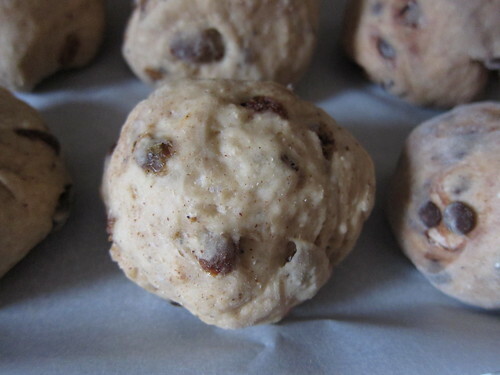 Nonetheless it’s a tasty treat that makes you feel less guilty about eating them and very easy and quick to make. 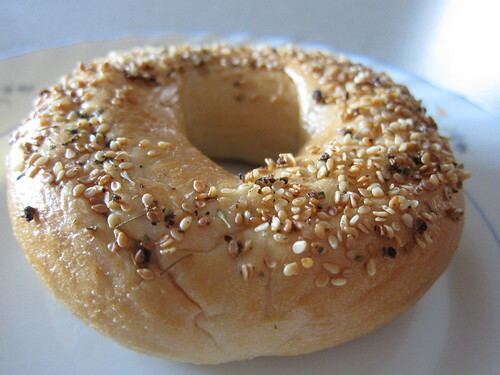 After having my first taste experience of bagels in New York (Ess-a-Bagel), I’ve been on a search to find some delicious Bagels down here in Melbourne. 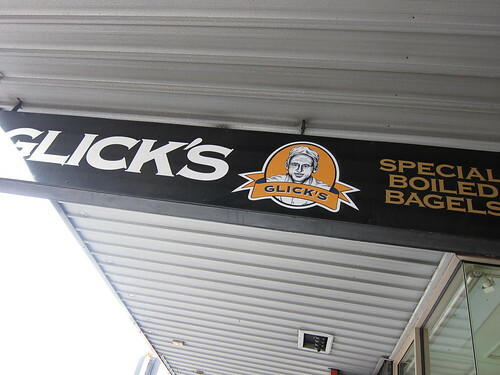 One of the best ones I’ve tasted are Glick’s Special Boiled Bagels, I don’t know what’s special with their boiling but whatever they do it’s working a treat. 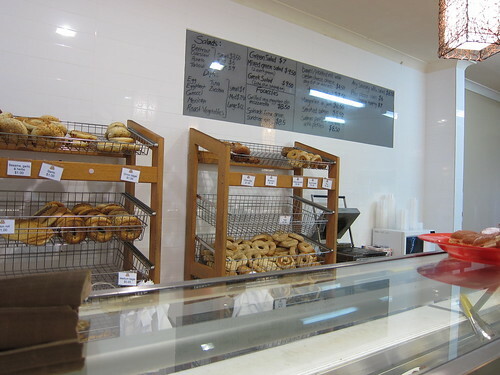 Glick’s have a few locations, the one I frequent is in Elsternwick, down on Glenhuntly road, just a few minutes from Elsternwick station so it’s quite convenient if you want a Bagel fix! 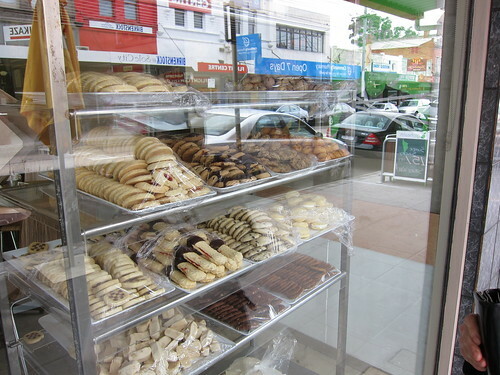 Their store also sells a variety of sweets and savoury items which I haven’t had the chance to try but they look tasty. 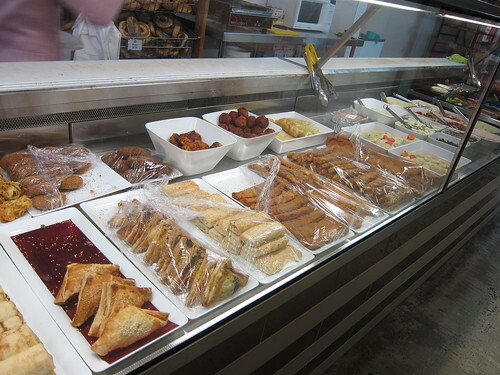 Of course, being a bakery and all, it serves breads and sandwiches and snacks. Glick’s is great because they have a large variety of choices. On the top of my head they have plain, herb, poppyseed, wholemeal, the lot (everything), and berry. 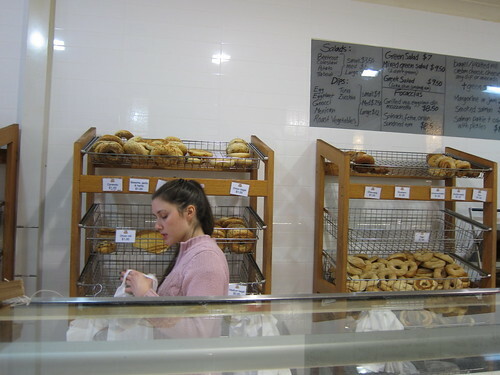 Aside from their fresh Bagels, you can buy their fridge/frozen selection of plain, poppy seed or sesame which taste as good as the fresh ones. So if you ever have a craving you can just defrost a few and off you go! We always try one of each and the everything Bagel is packed full of flavour, and when lightly toasted it gives out a very aromatic smell. I probably could go on about their Bagels but I’ll stop now. 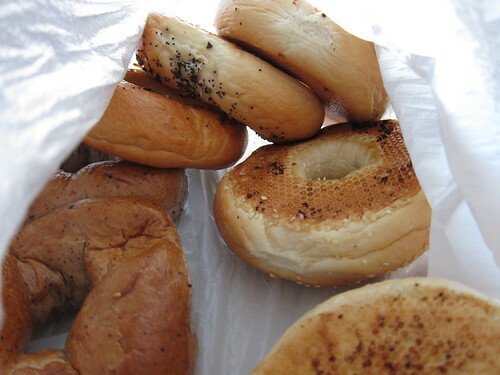 If you liked Ess-A-Bagels in NY, these will more than satisfy your cravings. 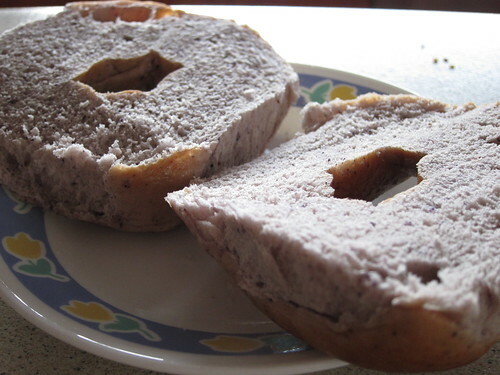 Glick’s Bagels are dense, chewy and slightly doughy. So you can’t go wrong. As they have stores in the CBD, South Melbourne, Balaclava, Bentleigh, Malvern and of course Elsternwick. You’d bound to run into one so I definitely recommend you check it out.